Small volumes of anti-DNAJB6 antibody vial(s) may occasionally become entrapped in the seal of the product vial during shipment and storage. If necessary, briefly centrifuge the vial on a tabletop centrifuge to dislodge any liquid in the container`s cap. Certain products may require to ship with dry ice and additional dry ice fee may apply. This gene encodes a member of the DNAJ protein family. DNAJ family members are characterized by a highly conserved amino acid stretch called the 'J-domain' and function as one of the two major classes of molecular chaperones involved in a wide range of cellular events, such as protein folding and oligomeric protein complex assembly. This family member may also play a role in polyglutamine aggregation in specific neurons. Alternative splicing of this gene results in multiple transcript variants; however, not all variants have been fully described. 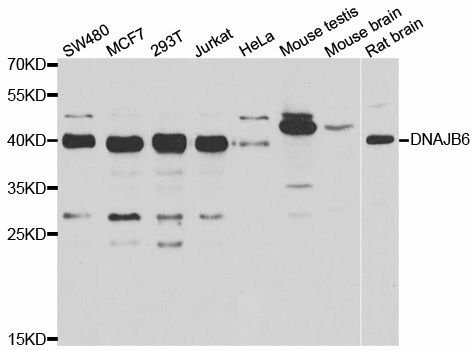 Western blot analysis of extracts of various cell lines, using DNAJB6 antibody at 1:1000 dilution. 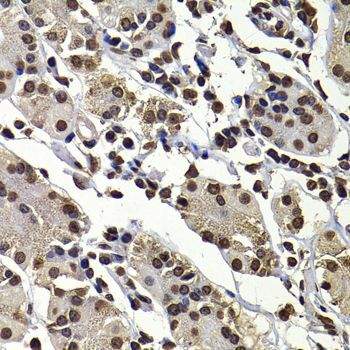 Immunohistochemistry of paraffin-embedded human well-differentiated squamous skin carcinoma using DNAJB6 antibody at dilution of 1:100 (40x lens). 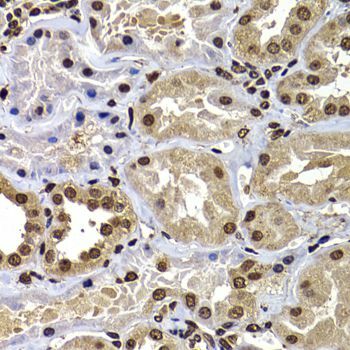 Immunohistochemistry of paraffin-embedded human kidney using DNAJB6 antibody at dilution of 1:100 (40x lens). 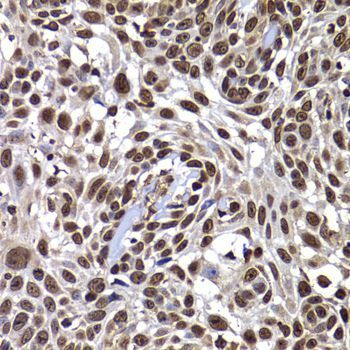 Immunohistochemistry of paraffin-embedded human kidney cancer using DNAJB6 antibody at dilution of 1:100 (40x lens). 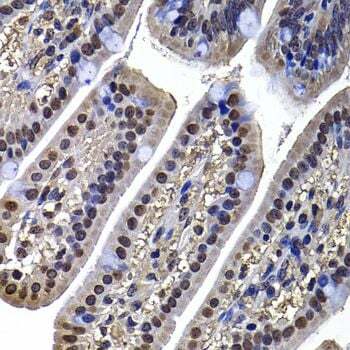 Immunohistochemistry of paraffin-embedded human stomach using DNAJB6 antibody at dilution of 1:100 (40x lens). Immunohistochemistry of paraffin-embedded mouse ileum using DNAJB6 antibody at dilution of 1:100 (40x lens). 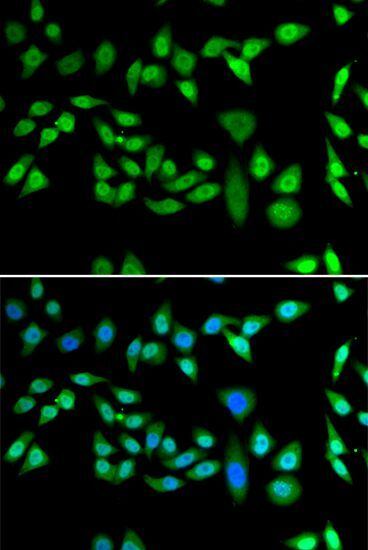 Immunofluorescence analysis of U2OS cells using DNAJB6 antibody. Blue: DAPI for nuclear staining. 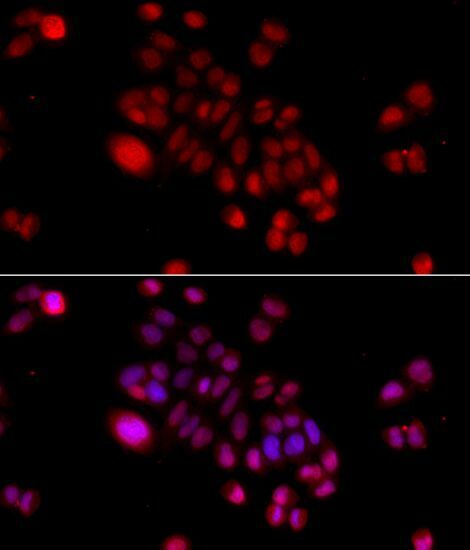 Immunofluorescence analysis of HeLa cells using DNAJB6 antibody at dilution of 1:100 (40x lens). Blue: DAPI for nuclear staining. NCBI/Uniprot data below describe general gene information for DNAJB6. It may not necessarily be applicable to this product. DNAJB6: Plays an indispensable role in the organization of KRT8/KRT18 filaments. Acts as an endogenous molecular chaperone for neuronal proteins including huntingtin. Suppresses aggregation and toxicity of polyglutamine-containing, aggregation-prone proteins. Isoform B but not isoform A inhibits huntingtin aggregation. Has a stimulatory effect on the ATPase activity of HSP70 in a dose-dependent and time-dependent manner and hence acts as a co-chaperone of HSP70. Also reduces cellular toxicity and caspase-3 activity. 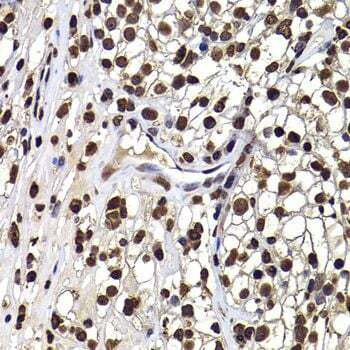 Defects in DNAJB6 are the cause of limb-girdle muscular dystrophy type 1E (LGMD1E). An autosomal dominant myopathy characterized by adult onset of proximal muscle weakness, beginning in the hip girdle region and later progressing to the shoulder girdle region. There is evidence that LGMD1E is caused by dysfunction of isoform B (PubMed:22366786). 3 isoforms of the human protein are produced by alternative splicing.